Work is underway for the metro rail aimed at easing the traffic problems in the capital. The work from Uttara to Agargaon is visible. Work is also underway in Japan where coaches are being constructed. Once the work is done, the coaches will be brought back to Dhaka by waterway, MD of Dhaka Mass Rapid Transit Company (MRTC) M N Siddique has confirmed. 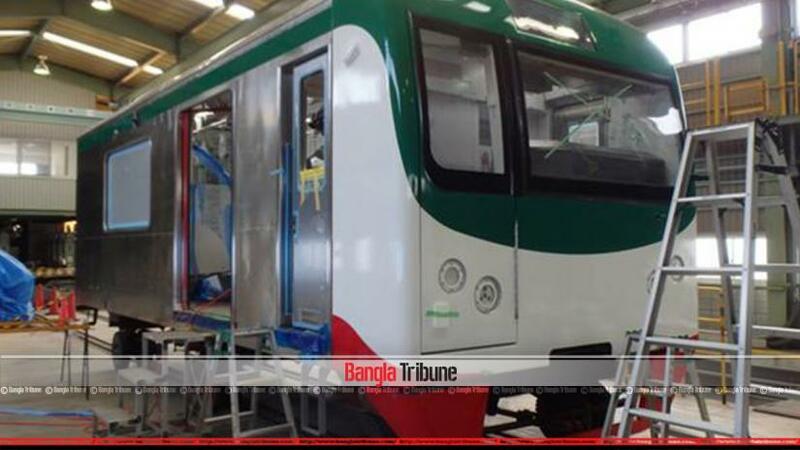 Project source says Kawasaki-Mitsubishi consortium will supply the metro rail coaches which will be green and red to capture the tradition and history of Bangladesh. Once the construction of the track is done, coaches will be placed and the power connection is given. The coaches will be of stainless steel and air-conditioned, have six buggies with the capacity to carry 1,738 passengers. The trains will also have seats for physically challenged people. In the Uttara-Motijheel 20 km railway, there will be 770 spans and sixteen stations. In the trains, 942 people can be seated while 754 will be able to stand. Running at 100 km per hour, the train will reach Motijheel from Uttara in 37 minutes. There will be a train every four minutes and every hour 60,000 passengers will be able to commute on both sides. The stations will be two-storied buildings housing ticket rooms and the entry will automatic. The stations are Uttara North, Uttara South, Uttara Centre, Pallabi, Mirpur-11, Mirpur-10, Kazipara, Sheorapara, Agargaon, Bijoy Sarani, Farmgate, Karwan Bazaar, Shahbagh, Dhaka University, Bangladesh Secretariat and Motijheel. The work was inaugurated by Prime Minister Sheikh Hasina, on Jun 26, 2016. Japan International Cooperation Agency is providing Tk 165.94 billion as development aid of this Tk 220 billion project. The government is spending TK 53.95 billion.